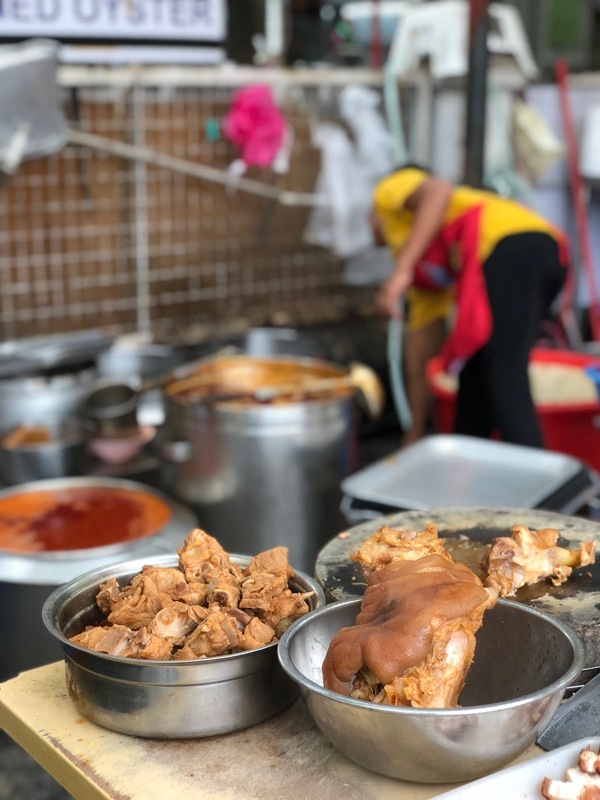 Home #foreverhungry 2018 PENANG ITINERARY 4 days 3 nights Penang Itinerary Malaysia Penang Penang Itinerary Things to do in Penang where to eat in Penang 5 Best Place for Street Food in Penang 2018! Last year, H & I visited Penang for 3 Day 2 Night food trip and managed to try out lot of Penang food! 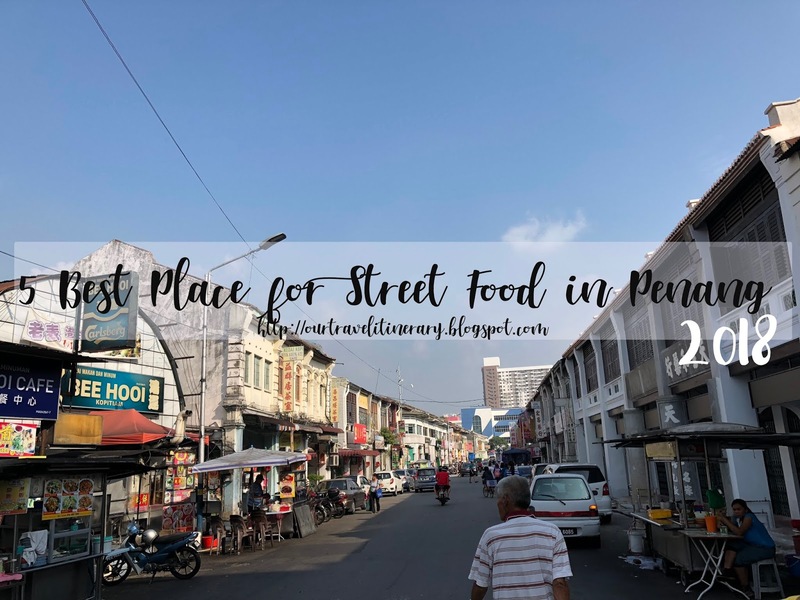 This year, we Penang for 4 Day 3 Night and revisited some favourite as well as exploring new ones. 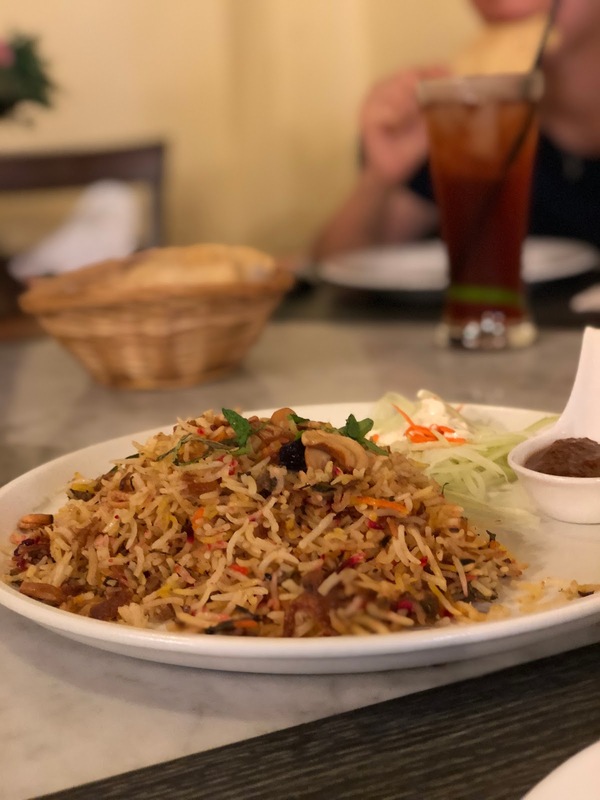 Although we didn’t get to eat our favourite Koay teow soup in Penang( Pitt Street Koay Teow Soup), we manage to try out new stuff! 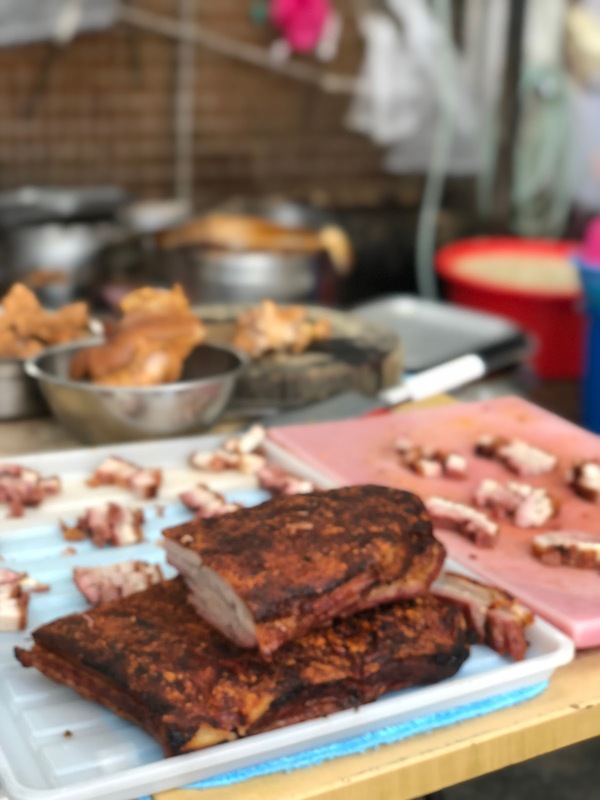 Here’s our 5 favourite food in Penang 2018! Unlike the Prawn Noodle we have in Singapore, the prawn noodle in Penang does not comes with big prawns. Neither do they have the option to choose dry/soup. There is only one option soup base prawn noodle. & there is a reason why they didn’t have to. Even after the noodles are soak in the broth, it still taste as good! We ordered one bowl each for ourselves and we finish everything in the bowl, including the broth! I love the thick broth! It has a really has a very strong shrimp taste that probably turn people who does not like prawn away. Pork rib was used to prepare the broth and fried pork lard was added to give extra sweetness to the broth. I ordered the Bee-hoon & yellow noodle so that it gives more texture to the bowl of Prawn Noodle. Plus, the chilli paste is spicy but very addictive too! I think the only downside is the serve size. Pretty small bowl compared to other Prawn Noodle in Penang. So we added roast pork! Worth every calorie! If you ask the local where is the best Chee Chong Fun in town, they will tell you the one in Genting Cafe. Unlike the normal sweet paste we tried, their paste is mixed with prawn paste and peanut butter, making it thick, fragrant and unique! The Chee Chong Fun is thick but soft when you take a first bite! Unfortunately, Genting Cafe is located very far from George Town and requires a 20-30 min car ride. We love Chee Chong Fun so we don’t mind the journey there! Plus, other local food sold in the kopitiam is pretty good! The Curry Noodle, Char Koay Teow and Wonton Noodle! Good and affordable! Definitely better than the ones in Kimberly street or Gurney Drive. Avoid visiting during weekend! I heard the queue is really long! 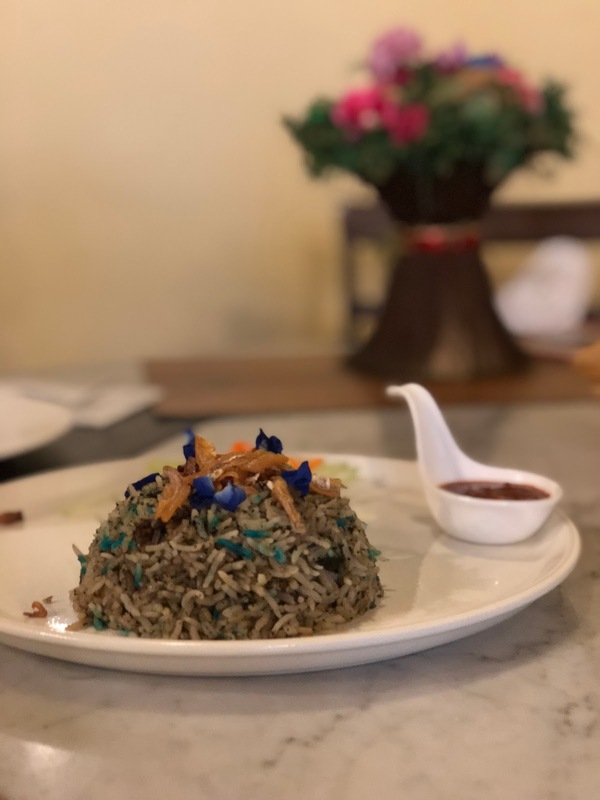 This is probably my first time trying indian-muslim Peranakan. We ordered a couple of ala cart dishes to share because this was our 10th meal of the day. The curry chicken was really good and meat falls off the bone easily. The lamb stew was not gamey and meat was tender! Vegetables curry was very flavorful and delicious! The Briyani is probably the best i had! Every dish blew us away! 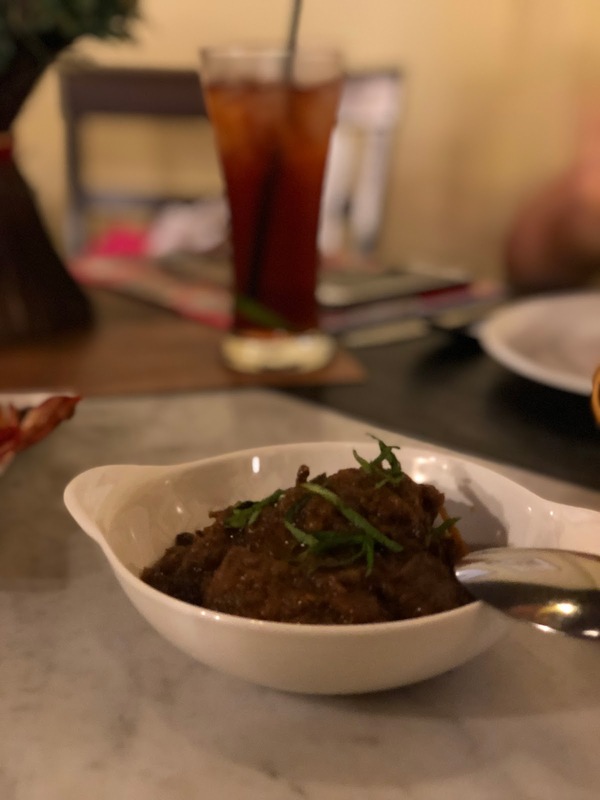 If you are looking for Indian-Muslim Peranakan food, this is definitely the place to visit! Do make reservation before going down! Curry Mee is actually yellow noodle with curry broth. 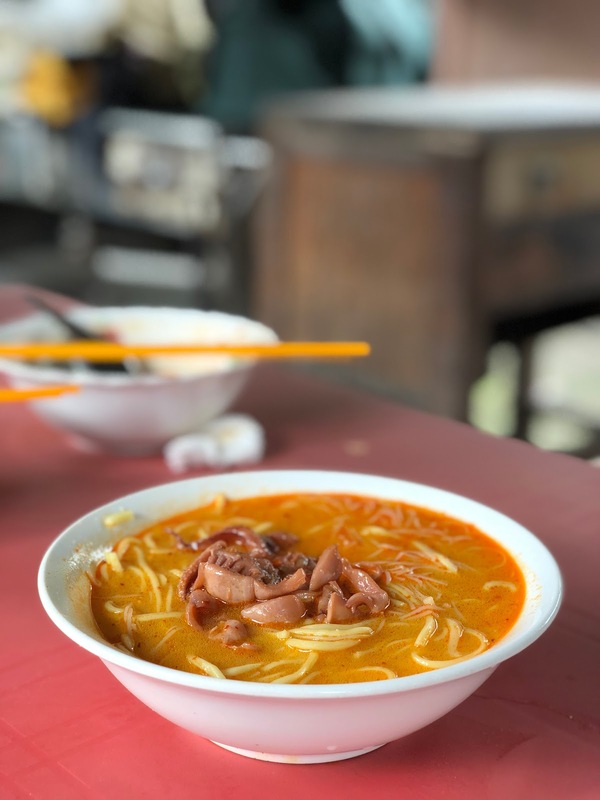 Air Itam Sister Curry Mee have been selling Curry noodle in Penang for more than 70 years. The curry broth is boil over charcoal and we all know that food prepared using charcoal always have a this “magical taste”. Just kidding. Using charcoal to cook always burns hot, way hotter than a gas stove can managed. Anyway, we were lucky to purchase the last second bowl of Curry Mee! We were left with little options to choose from but it was still good! Especially the broth! Although not the usual thick curry taste, the broth is watery and unique! Top with cuttlefish, the bowl of curry mee is so good! Usually, the Curry noodle comes with cuttlefish, tapok and you can even add pig blood to your noodle! (Skip this if you don’t like pig blood!) Can’t wait to revisit this place! 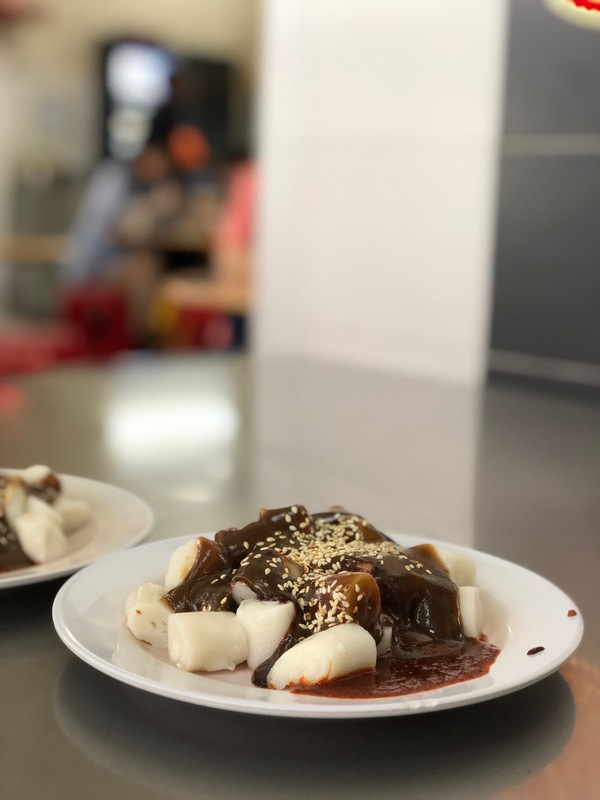 Hock Seng Rojak, aka the most expensive rojak in town. Despite being expensive, it is still recommended by many grab driver we met. Unlike traditional Rojak that comes with tau-pok, this rojak comes with lots of fruits! The sauce used is very thick and has a very strong shrimp flavor. I love the peanut that comes with it! Crunchy! Unfortunately, the thick and generous sauce can be quite overwhelming for some. Thus, i recommend you to buy the sauce back and make to your own taste! We did and it was better than the ones we had there. Have the rojak spicy so that it is not too sweet and you won’t get sick of it! & yes, the next trip we are probably gonna grab a few more pack of sauce home! Read things to know before visiting Penang here!